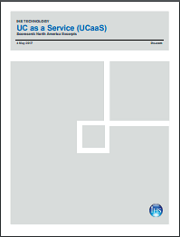 The UC as a Service (UCaaS) Scorecard profiles, analyzes, and ranks leading hosted unified communications service providers in the U.S. and Canada. Service provider scores are based on criteria such as installed base of lines or seats, financial stability, market strategy, service development and support options. Service provider scores and data are displayed in charts and tables in the report, accompanied by service provider profiles describing their offerings and analysis of the individual scores.